These images, and the accompanying descriptions, come from Arthur H. Robinson's Early Thematic Mapping in the History of Cartography (1982). John Snow pioneered the use of statistical mapping to deduce the link between cholera and contaminated water. 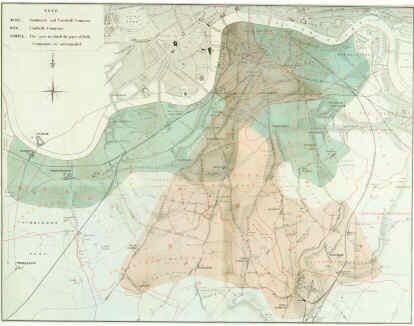 In addition to the famous dot map of the outbreak of the disease in the area surrounding the Broad Street pump, he prepared this map showing the areas served by two water companies, the Southwark and Vauxhall Company, and the Lambeth Company, south of the Thames in London. 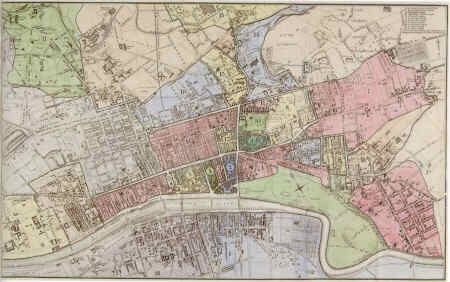 He did not control for the greater proximity of the Southwark clients to the Thames, nor did he display disease incidence on the map, yet the visual evidence was clearly apparent. Dr. Robert Perry, senior physician to the Glasgow Royal Infirmary, collected data on the outbreak of new cases of an epidemic, probably influenza, in the districts of Glasgow. "numbered the different districts on a map of the city .... marking with a darker shade those parts where the epidemic was most prevalent, which shows that those places most densely inhabited, by the poorest of people, have suffered most severely." "wholly the work of the inmates [of the Lunatic Asylum at Gartnavel]. It is hoped that this circumstance will induce the reader to make allowance for anything he may observe amiss in the manner in which this, their first essay, has been performed. "